Chickpeas are creamy-white, protein-rich legumes used in the Indian and international cuisine. They are also known as Chana, Chole or Kabuli Chana. 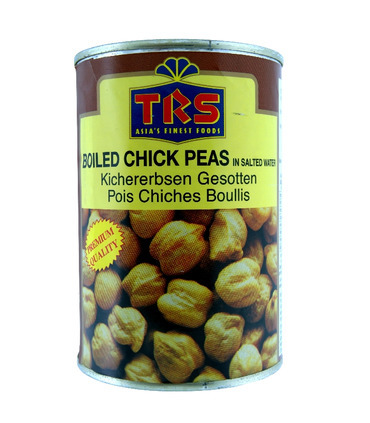 These pre-boiled TRS Chickpeas are almost ready to use, requiring only a few minutes of cooking with the curry masala to absorb the flavour of the gravy. Uses - Chickpeas are used in many Middle Eastern countries in dishes like falafels. - Along with spices, tomato, ginger garlic, onion and Indian spices it is prepared as a very delicious main course dish - 'chhole' - which is usually served with rice, puri or bhatura. 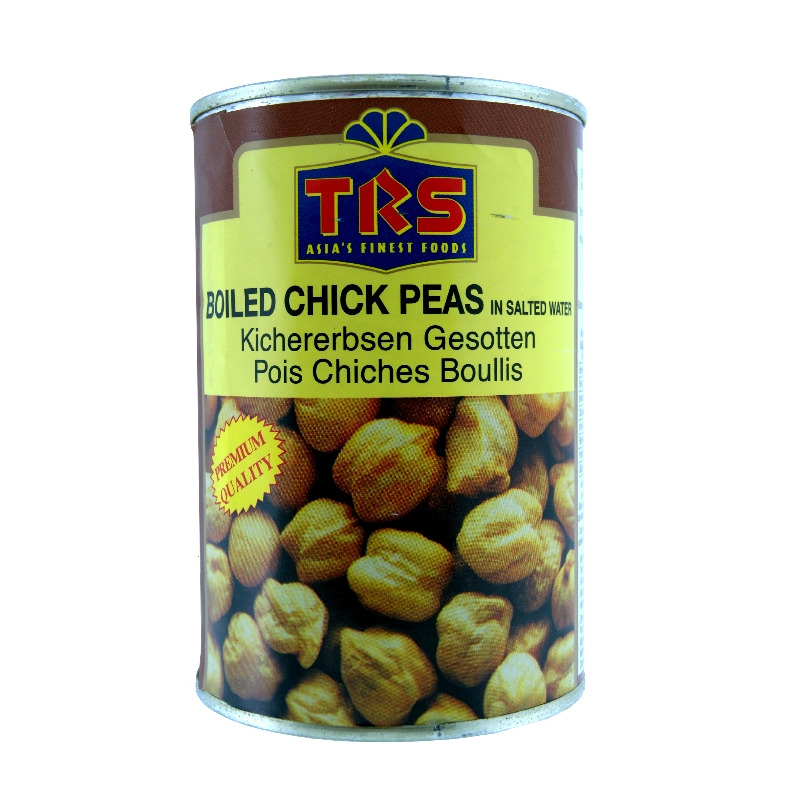 - It can be added to chaats, salads and soups. - It can be consumed as snacks when roasted with some spices. - It is used to prepare the South Indian ‘Sundal’ during the festival of Navratri and Gollu. - It can also act as a binding agent, and can be used to prepare patties. Health Benefits - Chickpeas are rich in fibre and thus can aid weight loss. - As it is rich in protein, Chana is a healthy addition to a vegetarian diet. - It contains iron and manganese which helps in boosting the energy levels. - It is believed to be helpful in stabilizing blood sugar. - It helps in lowering bad cholesterol. 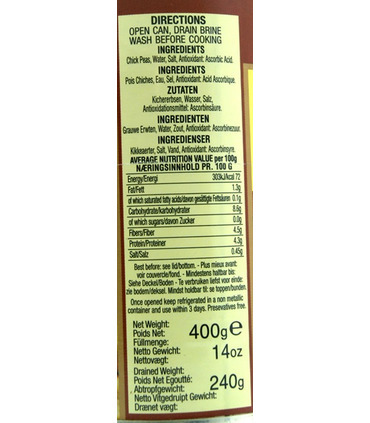 - It contains a lot of folic acid. Recipe : Chhole 1. Take 2 Chhole tins, remove the water, wash and set aside. 2. Heat oil in a pan, fry 2 chopped onions for 5 minutes. Then add 1 tsp grated garlic &amp; ginger, and green chillies (optional). Fry till the onions are soft and add 2 spoons of chana masala and sauté on low heat. 3. Then add 1 chopped tomato and 1 tsp crushed kasoori methi. Cook till the mix becomes soft and comes together. 4. Add the chana to this mixture along with salt and a little water to make a thick gravy. Cook on low heat for 10 minutes. 5. Garnish with chopped onions, coriander leaves, lemon juice and serve hot with puris or bhaturas. Read more about chickpeas here . Chickpeas are creamy-white, protein-rich legumes used in the Indian and international cuisine. They are also known as Chana, Chole or Kabuli Chana. 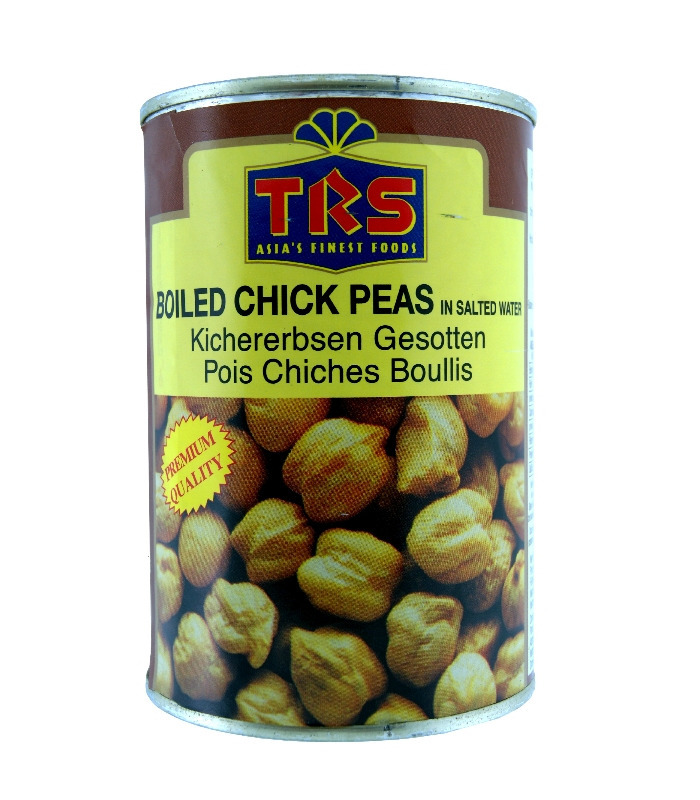 These pre-boiled TRS Chickpeas are almost ready to use, requiring only a few minutes of cooking with the curry masala to absorb the flavour of the gravy. - Chickpeas are used in many Middle Eastern countries in dishes like falafels. - Along with spices, tomato, ginger garlic, onion and Indian spices it is prepared as a very delicious main course dish - 'chhole' - which is usually served with rice, puri or bhatura. - It can be added to chaats, salads and soups. - It can be consumed as snacks when roasted with some spices. - It is used to prepare the South Indian ‘Sundal’ during the festival of Navratri and Gollu. - It can also act as a binding agent, and can be used to prepare patties. - Chickpeas are rich in fibre and thus can aid weight loss. - As it is rich in protein, Chana is a healthy addition to a vegetarian diet. - It contains iron and manganese which helps in boosting the energy levels. - It is believed to be helpful in stabilizing blood sugar. - It helps in lowering bad cholesterol. 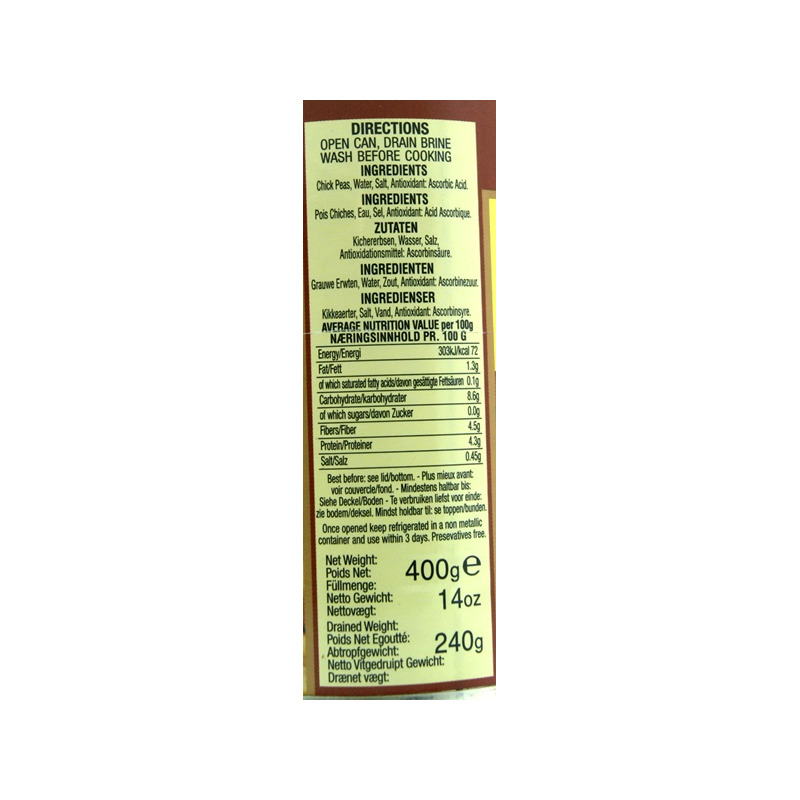 - It contains a lot of folic acid. 1. Take 2 Chhole tins, remove the water, wash and set aside. 2. Heat oil in a pan, fry 2 chopped onions for 5 minutes. Then add 1 tsp grated garlic & ginger, and green chillies (optional). Fry till the onions are soft and add 2 spoons of chana masala and sauté on low heat. 3. Then add 1 chopped tomato and 1 tsp crushed kasoori methi. Cook till the mix becomes soft and comes together. 4. Add the chana to this mixture along with salt and a little water to make a thick gravy. Cook on low heat for 10 minutes. 5. Garnish with chopped onions, coriander leaves, lemon juice and serve hot with puris or bhaturas. Read more about chickpeas here.